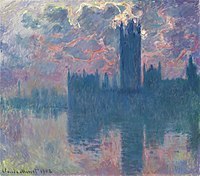 Claude Monet painted a series of oil paintings of the Palace of Westminster, home of the British Parliament, in the fall of 1899 and the early months of 1900 and 1901 during stays in London. 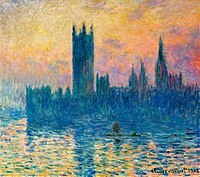 All of the series' paintings share the same viewpoint from Monet's window or a terrace at St Thomas' Hospital overlooking the Thames and the approximate canvas size of 81 cm × 92 cm (32 in × 36 3/8 in). They are, however, painted during different times of the day and weather conditions. 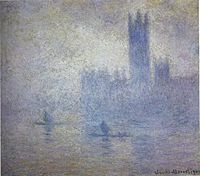 By the time of the Houses of Parliament series, Monet had abandoned his earlier practice of completing a painting on the spot in front of the motif. He carried on refining the images back in France and sent to London for photographs to help in this. This caused some adverse reaction, but Monet's reply was that his means of creating a work was his own business and it was up to the viewer to judge the final result. 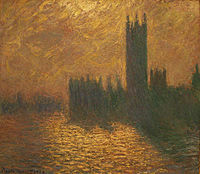 Le Parlement de Londres, soleil couchant, 1903, National Gallery of Art Washington, DC. Modern view of the Houses of Parliament at dusk in an approximately identical angle. The paintings were framed to exclusively depict the leftmost half of the building, with Victoria Tower as the focal point. 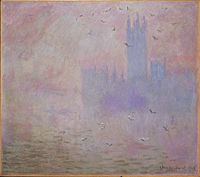 In 2018, the Tate Britain in London exhibited six paintings of the series, together in a single room, for the duration of a temporary exhibition titled Impressionists in London, French artists in exile (1870–1904), devoted to the temporary exile of French and impressionist artists in London during the Franco-Prussian War. This was a rare occurrence because no museum owns or exhibits more than two in a permanent collection. The paintings were also shown at the Petit Palais when the temporary exhibition travelled from London to Paris. Again in 2018, the National Gallery in London exhibited three paintings of the series, together in a single room, for the duration of a temporary exhibition titled Monet & Architecture, devoted to Claude Monet's use of architecture as a means to structure and enliven his art. This was a rare occurrence because no museum owns or exhibits more than two in a permanent collection. 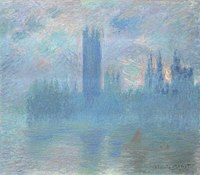 ^ "Claude Monet: The Houses of Parliament (Effect of Fog) (56.135.6) In Heilbrunn Timeline of Art History. New York: The Metropolitan Museum of Art, 2000–. (December 2010)". ^ "Monet, Claude: Houses of Parliament, London". ^ "'Hospital view. Experts decipher where Monet was standing', James Randerson, Wednesday 9 August 2006, Guardian Unlimited". 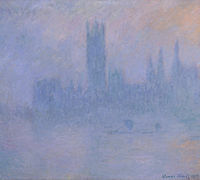 ^ "'Monet's view of London parliament for auction', Michael Parsons, 2 May 2015, The Irish Times". ^ Brown, Mark (18 July 2017). 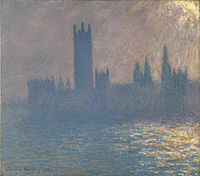 "Monet's UK parliament paintings to feature in Tate Britain exhibition". The Guardian. Retrieved 26 March 2018. ^ Sooke, Alastair (30 October 2017). 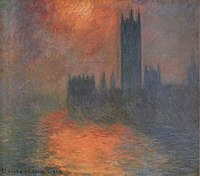 "Not very impressionistic, but beautiful all the same - Impressionists in London Tate Britain, review". The Daily Telegraph. Retrieved 26 March 2018. ^ Palais, Petit (1 January 2018). "Impressionists in London". Petit Palais. Retrieved 25 May 2018. ^ Krefeld, Kuntsmuseen (1 January 2018). "Art Before 1945". Kunstmuseen Krefeld. Retrieved 3 April 2018. ^ "Monet & Architecture". National Gallery, London. April 2018. Retrieved 20 December 2018. 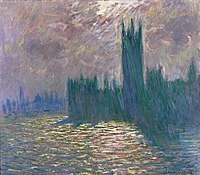 Wikimedia Commons has media related to Houses of Parliament Series (Monet). Baker, Jacob; Thornes, John E. (8 December 2006). "Solar Position within Monet's Houses of Parliament". Proceedings of the Royal Society A: Mathematical, Physical and Engineering Sciences. 462 (2076): 3775–3788. Bibcode:2006RSPSA.462.3775B. doi:10.1098/rspa.2006.1754.